I’ve been a major hypocrite lately. It’s so easy to get all sucked into your own little world of encouraging others while forgetting about yourself. I had this moment of awakening one morning when I walked into our local coffee shop and saw two women I adore immensely. Two women whom I look up to and am inspired by on a reoccurring basis. I am drawn to these strong, smart, beautiful, yet vulnerable women so it was only natural for my heart to flutter when I saw them through the window. As I walked up I was selfishly expecting to see warm smiles, hugs, and friendly joy. I did get all of these things but also a little tough love. These were two women whom I had recently met with individually about life and business. During those talks I had given them gobs of unsolicited advice and encouraged them to push themselves to their limits. “Don’t worry about perfection, go write a new post before our next meeting,” to one I pushed. “You need a website or a blog…nothing crazy just something basic to get started,” to the other I encouraged. That morning at the coffee shop as they sat having coffee together they said, “We were just talking about you.” What followed was that kind of friendly tease you get from close friends who are calling you out on your crap but in that nice way. And it was fully and completely justified. I walked out of the coffee shop loving those two women even more than I did when I walked in. They were completely right to point out how I was lacking to do the very things I was so eagerly and intensely pushing them to do. I hadn’t blogged in months, I had recently started my own marketing business yet I had no website…nor business blog. The reason I emotionally grabbed ahold of these women that much more and gained even more respect for them was because they were holding me accountable. I’ve always been an advocate for “Accountability Partners.” I used to look for these partners to help me reach healthy habit goals or reach physical fitness milestones. For example, this past May I completed my first half marathon and would have had a really hard time doing so without my accountability partners. One of those partners actually trained and ran with me while another I simply promised to text after completing each hard training run. In life, just like workout buddies, sometimes we need professional buddies or life buddies. These are people whom you share your goals and your challenges with. They meet with you, team up with you, text, call, or do whatever it takes to help you stay on track. Sometimes these people are our bosses, our spouses, our therapists, our pastors, our professional coaches, our mentors, peers, family, or a stranger across the gym you are competing with. Either way it’s so impactful to have someone in your life who can help you reach your goals and stay on track. Life is full of distractions and excuses. 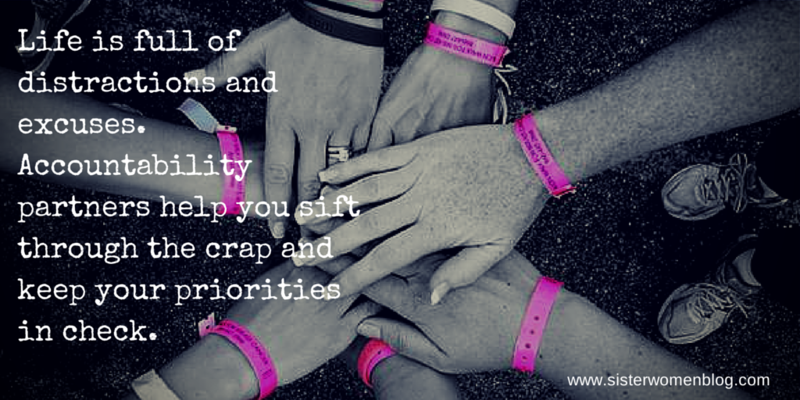 Accountability partners help you sift through the crap and keep your priorities in check. I left with my coffee feeling estranged. Estranged from my own path. Later that night and many nights after, I reflected on my encounter with these two women and the accountability they were passively throwing in my face. I realized in order for me to be a good accountability partner to them or to anyone I have to keep myself in check too. Or else I’m just preaching and not performing. I know it’s cliché but seriously…you have to “practice what you preach.” So, Dani had fulfilled her promise and posted a blog to her personal blog prior to our next coffee date. Karen stuck to her guns and continues to take one bite of her elephant at a time (as she should) and is meeting with the proper professional consultants to gear her business up at the right tempo. It’s my turn to bring my A game. Not only for myself but also for them so I can hold up my end of the deal. I want to keep having “coffee with strong women” after all. Each of us needs to be held accountable not just for our shortcomings or pitfalls but for the plans and paths we need to take to reach our potential. It’s up to you to choose what you do with the accountability and who you align with. Some may be silent partners while others are actively participating in your journey right alongside you. Either way we all need them. So embrace them and don’t let them down. You’re only letting yourself down in the process. They are merely holding you accountable for reaching your own goals after all. I ❤️ you. Thanks for being vulnerable! Keep your truth and striving to be on that path. You are so authentic — that’s one of your strengths. Thanks for spreading around your inspirations! These are the kind of people everyone needs around them.